Sleep apnea is a common sleep disorder that occurs when breathing is stopped for ten or more seconds at a time. While most patients have some apnea events each night, patients who suffer from sleep apnea can have hundreds of these events during sleep. If you suffer from sleep apnea, you likely believe the only way to renew your health is to visit a sleep doctor and undergo CPAP therapies. Unfortunately, more than 50% of patients are found to be CPAP intolerant, which means they’re unable to adjust to the treatment. 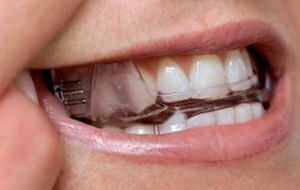 Luckily for Lincoln dental patients at Olberding Dental, we have a comfortable, effective solution – oral appliance therapy. 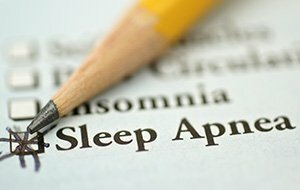 If you’ve been diagnosed with sleep apnea, call our Lincoln dentist and team to schedule your appointment today. There are numerous adverse health effects associated with sleep apnea. Perhaps the most obvious is the serious detriment to health that occurs due to a lack of sleep. People who are exhausted are more likely to become ill and be in accidents. In addition to severe exhaustion, sleep apnea also elevates blood pressure. Each time you experience an apnea event, your body triggers a panic reaction to restart breathing. This elevates blood pressure and places strain on your heart. This increases your risk for cardiovascular disease and strokes. Oral appliances offer many patients with obstructive sleep apnea a viable alternative to CPAP therapies. CPAP uses forced air to keep the obstructed airway clear during sleep. Oral appliances perform the same function by repositioning the jaw. If you’ve ever taken a first aid or CPR course, you likely remember that before you begin mouth to mouth, you need to clear the airway. This involves tilting the head back and the jaw forward. This positioning places pressure on the throat muscles to open the airway. The same method is used for oral appliance therapy. Instead of simply repositioning the head to place pressure on the throat muscles, oral appliances are custom-designed to shift the jaw forward, creating the necessary pressure on throat muscles to hold the airway open. This allows patients to breathe deeply and sleep soundly through the night. We use our 3D CT scanner to accurately diagnose sleep apnea and create a custom oral appliance to precise specifications. The 3D images we produce allow us to see exactly how the oral and facial structures are working together. When we create an oral appliance, we can use the CT scanner to ensure your airway is clear so you can sleep soundly through the night.